So are all the chess computers going with you? Or are you looking to offload a few? ideed I offloaded a few since my contract is for a year only (it can be prolonged, but only another year). I take the Risc with me, because it is still the most fun computer for me (I usually score 50%). And (I am Kittinger addicted) the Star Sapphire and the Diablo will also cross the great water. But for the small price (40 Euro), the upgrade is meaningful. In my next tournament, I will send the Montreux with 2048KB. [german on]Schau�n mer mal[/german off] (@Robert: Wie �bersetzt man das ins Englische? ). Ich w�rd' mal sagen: "Let's see, what happens!" I still have your Interface etc sitting there in my study waiting to try again. At the time I was just exhausted and frustrated trying everything to get the Smartboard and interface to work. In the end I gave up. But I did download the drivers you kindly provided and will try again in the Autumn. Summer tends to be taken up with summery things, and the chess computers get neglected. I have missed your posts a lot. Hope things are going well with you. I don�t know yet how it is like in Canada yet. The planes leaves in 10 days from now...I�ll let you know. Hey Christian, do you have a spare kit to connect a Tasc to a PC you're willing do sell, trade, give away? I think I remembered that you had sent one to Mike but I had no idea you still had more! Let me know the details. One rests peacefully in the old world (I never got any feedback from Mike whether it worked). So still there is one to be had. Maybe 22nd of August in Washington? As for the Tasc, when I mirrored the archive for the www.tasc.nl site on www.ismenio.com/tasc I copied a lot of the downloadable files they had but one thing that I would like to do is connect it to my PC but I know it will be very hard to get the interface for that. One more question, do you know how much the extra memory improves the ELO rating on it? very difficult. In the CSS /1/94) were awarded the RISC2500 30-50 Elo. But this was only the extension on 512K. But meaningfully the application is only on Tournament Level. But I cannot say an exact Elo. Not yet. I have tryed to improve the "standard" MB in mine montreux to 2MB and it didn't work . Can u send/produce them for/to me please 4x 8 euro . > Besteht auch bei diesem Ger�t die M�glichkeit der Aufr�stung ? > Nein, mit die montreux funktioniert es nicht. mein Montreux zeigt nach der Aufr�stung 2048 KB RAM an. Eingebaut habe ich die von Dir damsls f�r den RISC 2500 empfohlenen RAM Bausteine. Thanks again for all the great info! One more question, do you know how much the extra memory improves the ELO rating on it? here the picture of the back of the Montreux. Do you have also such a picture on the back? On the date, the info on my Montreux says: "256K ROM - 128K RAM Montreux v1.0 10-Dec-94"
Do you think it's hard to find the RAM chips today? I had made an error. You need 512 k x 8. 32Kx8 are in the "Standard Montreux". Well, it is not easy, but I could procure the chips for you. Price 4x ~8�. I'm humbled to see your post here! I always try to help, when I can. You have, in my opinion, the best site+community for chess computers out there! Oh no. Too much honour. Is important that it the guests like and they cooperate. They should have enjoyment in their hobby. And if schachcomputer info. can contribute to it, it would make me happy. I love all the sites, big or small. Exactly, that is it. We do not need a number 1. We need people, which have fun at their hobby and to bring in itself actively. Oh yes. I hope you make it also. A thing still. You have no downloads on your "TASC" side. Do you look for these things (Engines, Driver etc.)? Also, I have to say that your English is great! If I could use chess computers to compare you would be like a Tasc and I'd be like a CC1 I'm humbled to see your post here! 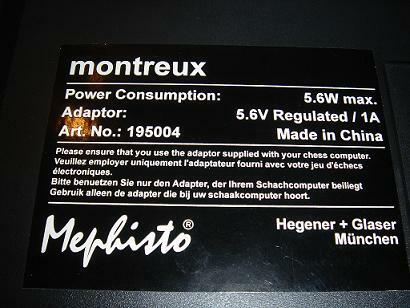 Mephisto was taken over in januari 1994 by saitek. The Risc 2500 have played in the W.K in madrid in november 1992 and in 1993 they where availible for us price 1199 dutch gulden =537 euro.The Montreux is from september 1995 1099 gulden= 499 euro .The Risc 2500 can be modified to 2MB memmory wich increase the playstrength. 1,5 week ago there was on ebay a Risc2500 2 Mb and was sold for about 450 euro . Also, any ideas as to why the power supply is so big? The output is 500mA so I can't understand why it would be so big!? This is not correct. Please, this power supply did not use. The Montreux needs 5.6 V +1A! Does anyone know how long Mephisto was producing it before the merge with Saitek? Mephisto was bought in 1994 from Saitek. The RISC2500 comes from the year 1993, the Montreux was produced from 1995. Also, has anyone upgraded the memory in one of these? Yes, I. 2MB are doable. You require 4x - 512Kx8 RAM. Last question, anyone has any estimate on the price of these "R30 little brothers", both current and when they were released? The Montreux to is got really heavily. Congratulation. P.S. : Congratulations to your fantastic website. Another recent acquisition, this Mephisto/Saitek Kasparov Risc 250 is interesting to me for two reasons. 2. The computer is the one that came with the box, but they're different as you can see in the pictures, the box is for the Saitek model but the unit itself still has the Mephisto "look and feel" to it, it's the Mephisto Montreux. Also, has anyone upgraded the memory in one of these? Also, any ideas as to why the power supply is so big? The output is 500mA so I can't understand why it would be so big!? Well, I don't know the answer to any of your questions, but the power supply that came with my Exclusive/Polgar 10 Mhz is also very large. I do have a question, though, to ask anybody. 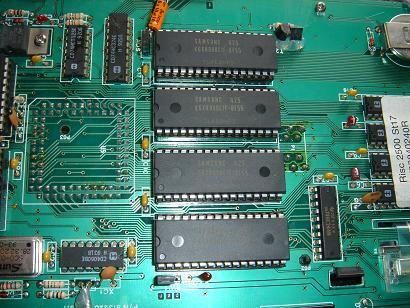 I just purchased a Mephisto Munich S board with the Risc 1MB 16 bit module. How does this Risc module compare with your Montreux in time frame of manufacture and strength? Are all Risc computers essentially the same?